After hearing about the wonders of cleansing oils, I got myself a bottle from Biore. Product says : Gentle cleansing oil washes away long lasting makeup, even waterproof mascara! 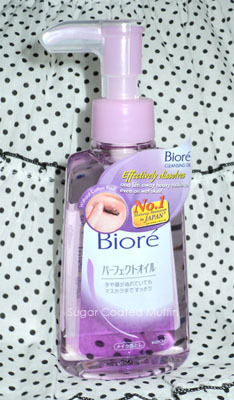 This oil based makeup remover from Japan has excellent cleansing abilities that makes makeup removal so quick and easy! It effectively dissolves and removes long-lasting makeup, even waterproof mascara, while lifting away dirt and impurities. Specially formulated to provide optimum cleansing performance at all times. It does not emulsify upon contact with water and can be used during showers. No greasy or sticky feeling on skin after use. Does not clog pores. Gentle and mild on skin. Refreshing fragrance. Removes waterproof mascara - I was amazed that it could actually remove my toughest mascara. I merely slapped on the makeup remover and massaged my face & eyes. It's so easy to use. Does not emulsify upon contact with water - Not sure what they mean here =_= I do use water to emulsify it. I find that it's easier to use if your face is slightly wet as when it's dry, the oil is not easy to spread. No greasy or sticky feeling - This doesn't emulsify completely so my face is still very greasy and double cleansing is needed. Does not clog pores - I didn't get any bad reactions from this but the mineral oil made my sister break out. Ever since I got this, I've been using it a lot as it's so simple to use. And no cotton pads needed! It's also easy to remove falsies with as usually cotton pads get stuck on the glue and all. However, it's not good at removing the glue itself from my lids. Ingredients : Mineral Oil, PEG-12 Laurate, Isododecane, Water, Isopropyl Palmitate, Cyclopentasiloxane, Poly glyceryl-2 Isostearate, Decyl Glucoside, Polysorbate 85, Glyceryl Oleate, Isostearic Acid, Isostearyl Glyceryl, Ether, Myristyl Alcohol, Isostearyl Glyceryl Pentaerythrityl Ether, Alcohol, BHT, Fragrance, Citric Acid, Tocopherol, Phosphoric Acid.